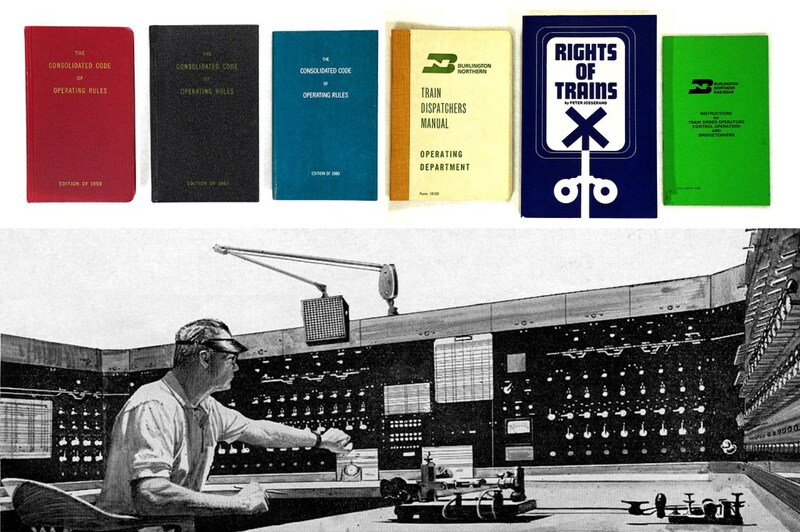 For many years every railroad had its own rule book with its own interpretation of operating and safety concerns. These were eventually consolidated into a single set of rules and issued to every trainman across the country. These vest-pocket-sized booklets served as each man’s operating catechism. Railroaders couldn’t go to work without them. Use of a consolidated code created widespread understanding of the basic “rights of trains” and how these rights would be maintained from the beginning to the end of each train trip. This was a most important factor in safe operation of trains. Without these universal rules in place it would be impossible to determine which train had the right to hold the main track while another got out of the way on a siding track. Most of us are familiar with the format of railroad public timetable (PTT); like their counterparts in airports, they show the arrival and departure times for passenger trains. Those are published for the convenience of fare-paying customers. Railroads also issued employee timetables (ETTs) that showed both passenger and freight train schedules—and more, including the different classes of trains. For example, first-class trains were superior to second-class trains, third-class trains, and extra trains. Second-class trains were superior to opposing third-class trains and to opposing extra trains. Third-class trains were superior only to opposing extra trains. Direction played into it too. Trains of the direction specified in the timetable (usually eastbound) were superior to trains of the same class in the opposite direction. Believe it or not, attention to these simple hierarchies of train classes generally kept all of the famous named-and-numbered trains safely rolling down the line without incident. When the first timetables were created time itself was an especially vexing issue to overcome. During the nineteenth century every town had its own idea of the current time of day. North American railroads overcame that problem initially by creating their own standard time system. They divided the continent into 144 one-hour segments. Train travel was just a short trip in those days so it actually made sense—then. But soon enough train trips became longer. When trains overlapped these short time zones, accidents occurred. A better solution was needed. The problem of creating a universally accepted standard time was solved at noon on November 18, 1883, when North American railways adopted a system called Railroad Standard Time. It proposed a five-zone system running east to west. In the final analysis a four-zone system was implemented. Although it took many years for this concept to spread, eventually people around the world began using the same timekeeping system. Railroad Standard Time became the world standard—all because there needed to be a way to safely control trains. The invention of the telegraph added near-real-time communication to key railroad offices. A telegrapher sent messages over the wire to other stations. Those messages were written down by the receiving stations and quickly distributed to everyone required to have them. Division headquarters, depots and interlocking towers were the primary places that used telegraphs until they were replaced by radios and telephones in the 1940s. Computers and microwave tower communication systems were added to the mix in the 1960s. Today, satellites and cellular communication are the dominant technologies. Signals played a major role too. Train-order signals were used at train-order stations to signal to approaching trains whether or not there was paperwork for them to receive. 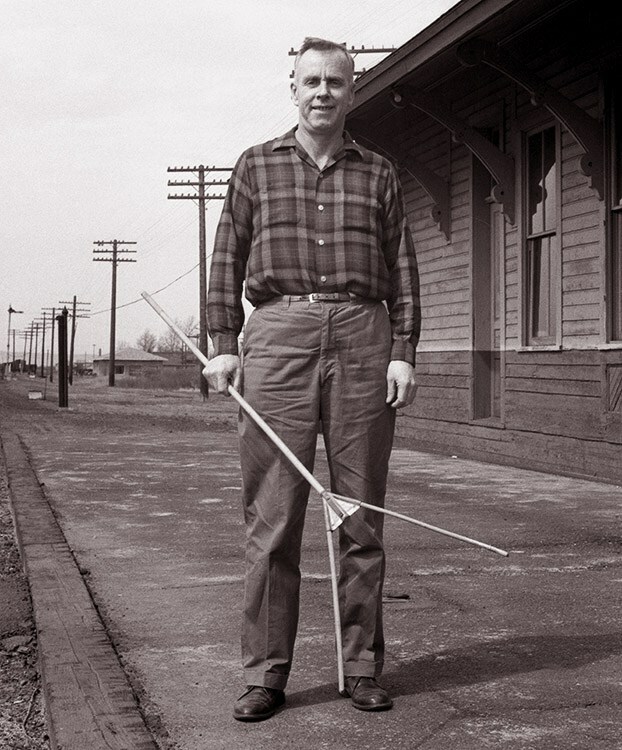 Interlocking signals protected the crossings and junctions of railroad lines. The interlocking towers controlled just those signals that allowed trains safe passage through the interlocking. And automatic signals installed on the line between different towers provided a way to space out trains safely. These then are the basic components of train control. While the notion of train control is generally considered to be the signals we see along the tracks, there is an important paper-based component of running trains as well. In fact, trains can’t leave their initial station without the proper paperwork. Train Order Control (TOC) provided the actual written communication issued to train crews at train-order stations (depots and towers). Those train orders spelled out exactly how far each crew had authority to operate its train and what to watch out for along the line. Sometimes the order gave a train authority to just the next train order station down the line where it would receive another order, and so on. A train order must be repeated to ensure accuracy, delivered to those who are to execute it, and expressed in the exact same words to all involved. For many years, there were two kinds of orders. The “31” order (on yellow tissue paper) had to be signed like the original train order. The “19” order (on green tissue) could be delivered without taking a signature. The “19” order was simply handed up to the front and rear end of a train without a stop. This was usually done with a pair of order hoops (or order forks) on long wooden poles. They could be handed up to passing trains by the depot agent or tower operator, or mounted in a stationary rack next to the track. The engineer of a passing train would grab his orders from the top hoop while the conductor would grab his orders from the bottom hoop as his caboose passed by the train-order station. The time saved by this method of delivery cannot be underestimated as delivery was instantaneous. Before carbon paper came along, multiple copies had to be hand-written one at a time, a method that introduced the possibility of errors between the different copies, which in turn could lead to train accidents. By using a metal backing along with the carbon under the set being copied, as many as a dozen identical orders could be made simultaneously by pressing hard with a stylus, pencil, or pen. Railroad carbon paper had carbon on both sides, to make the copy much darker. As the train orders were actually made of semi-transparent tissue paper they could then be read at night by transmitted light when held up to the open firebox door of a steam locomotive. When the dispatcher issued an order, he would send station calls on the dispatcher’s wire. This was a special telegraph, buzzer, or speaker in each building. He might say, for example, “Nineteen East.” Each operator addressed would then put out the stop signal to stop the approaching train. The phrase “Nineteen East” meant that each operator contacted needed to fill out the regular set of three copies of Form 19 for an eastbound train. One copy for the conductor, one for the engineer, and one to keep on file. If the dispatcher had said “Nineteen East copy 6,” then the operator(s) involved would each grab sufficient forms and carbons to make six copies, and so forth. This done, the dispatcher transmitted his order, underlining each word as he went along that he had written in his personal train-order book. He kept this in front of him at all times. Then the operators he addressed repeated the order back to him. As each did so, he underlined each word again, and if all was correct, he gave them “Complete,” which they wrote on the order in a space provided near the bottom of the form. They also included the time and their own name or initials. Orders were addressed to the conductor and engine man of a train (C&E), or to an operator (Opr). An order hoop was a thin cane bent in a circle at one end. The orders were tied to the hoop so they could easily be slipped off. The operator held up the hoop by the straight end, and the trainman on the approaching train thrust his arm through the hoop as the train passed without stopping. After removing the orders, he threw the hoop onto the ground, and the operator had to walk a fair distance to retrieve it. The better method was the order fork. An order fork was a wooden shaft about five feet long with a large Y shape at one end. The operator tied the orders to a loop of string that was held by spring clips on the open end of the fork. The operator held up the fork by its handle, and the trainman thrust his arm through the loop of string. But instead of snagging the entire fork, the string-loop and attached orders would surround the man’s arm so that he didn’t have to worry about dropping them on the ground. The order fork stayed in the operator’s hands. It didn’t need to be retrieved. 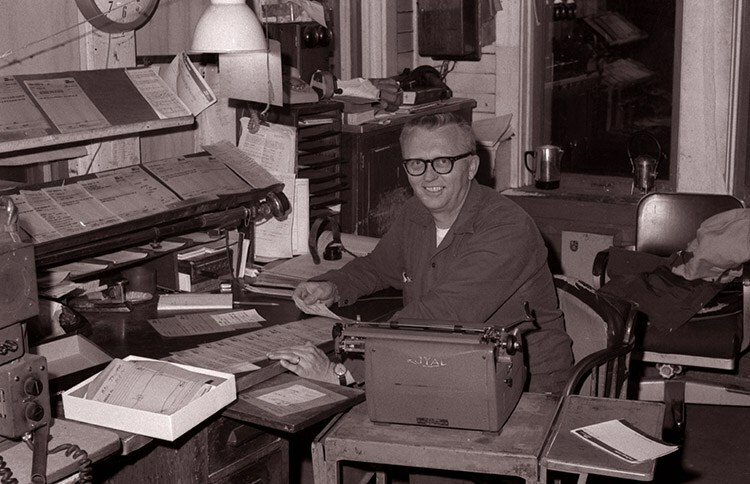 Jim Anderson working at the desk inside the tower on April 30, 1975. Hoops or forks could also be held at the proper height by inserting them in holes or clips of a post. This post could also hold a lantern to illuminate the orders at night so that they could be easily seen and grabbed on the fly. With this method the operator did not have to be present. He could load the hoops or forks with orders, mount them to the post, then go back to his other duties. More-modern facilities generally had spotlights focused on these train order stands to illuminate them at night. If a train needed orders and they were missed or dropped, then the train had to stop abruptly. The poor fellow who missed the paperwork had to get off the train and go find it. If the tower man wasn’t too busy he might take a walk to help find the dropped paperwork. For any train to start moving, it had to have a train order or a clearance card (or both) to give it life—unless it was specially provided for in the division timetable. So to leave a large yard a train might simply start with a clearance card. Then at the next train-order station it would pick-up more-detailed instructions on Form 19 provided by the tower man as the train passed through. The clearance card gradually expanded its scope. The first change was always to deliver a clearance card with orders, and to specify the number of orders accompanying it. Then the order numbers were specified, so the clearance card became an index to the orders received. Finally, the dispatcher was required to “OK” the clearance card. He could check that the proper orders were being delivered, and that none was forgotten. Sound complicated? Perhaps, but all that paperwork saved a lot of trains and consequently a lot of lives. Keeping up with the paperwork was just one of the many responsibilities of the men who labored at Superior’s Central Avenue Interlocking, leaving little wonder as to why the lyric, “I’ve been workin’ on the railroad all the live-long day!” held such great meaning for railroaders coast to coast. Times have changed and the work at this complex is greatly simplified today, as the Central Avenue Interlocking continues to handle the majority of freight tonnage coming into the Twin Ports.